Did you know that millions of pets go missing every year? Of those millions, less than 20% of dogs and less that 5% of cats are reunited with their families. The odds of finding a lost pet are greatly increased when the pet has a microchip. So, why don’t more people microchip their pet? In some cases, it is because they aren’t familiar with the process. In this blog, we are going to answer the most frequently asked questions. For even more information, call our clinic to speak with one of our educated staff members. A: A microchip is about the size of a grain of rice. A needle is used to place the chip under the animal’s skin between the shoulder blades. Each chip comes with a unique number that can be read by a scanner. Most veterinary offices and animal shelters have these scanners and are trained to scan every lost pet that comes in. 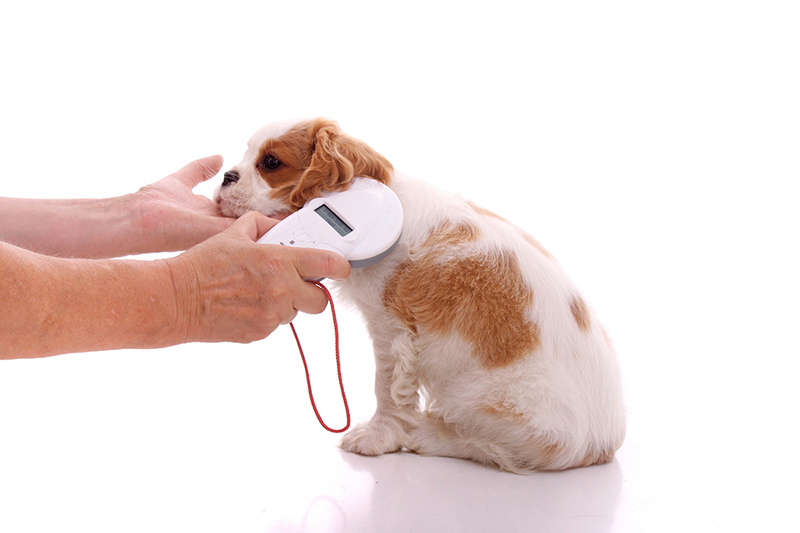 A: We won’t lie to you….it does require a large needle to place a microchip but it only takes an instant to do. Some pets seem totally unfazed by the placement, while others react for a brief moment. Soreness isn’t common, but does happen in a small number of cases. Sometimes, we implant the microchip while the pets is being spayed or neutered, so they don’t feel it at all. A: Two things must happen in order for the microchip to help reunite a lost pet with its family. The owner must register (and keep their contact information up to date) with the microchip company, and the person or animal shelter that finds your pet must scan the pet for a microchip. Microchips are not GPS or tracking devices. Once the chip is scanned, the clinic or shelter contacts the company that made the chip to get the owner’s information. This is why it is so important that you not only register the microchip, but have accurate contact information on file with the microchip company you have chosen. Did you know that more pets are microchipped than what are registered? Q: Will it really help get my pet back if they are ever lost? A: Absolutely! As we mentioned above, lost dogs are reunited with their families less than 20% of the time, but dogs that have a microchip are reunited with their families over 50% of the time! Cats without a microchip are reunited with families less than 5% of the time. Those with microchips were reunited with their families almost 40% of the time. That’s a HUGE difference! Perhaps those numbers would be even higher if all families registered the microchip and kept their information up to date. Q: Does the microchip replace identification tags? A: No. Tags are a quick way to identify a pet’s name, the vet clinic that administered the Rabies vaccine, and owner information. Just like with a microchip, the tags need to be current with accurate contact information. Microchips are especially important if a pet loses its tags or sneaks out of the house without its collar. Q: I microchipped my pet. Now what? A: Register your microchip with the microchip company. As an added benefit at our practice, the cost of registration is included with the price of microchipping and we will send in the registration papers for you! Anytime your contact information changes, make sure to update the company. Although microchips should last a lifetime, we recommend having your pet scanned periodically to ensure that it is functioning properly.